On the first day of the program, the app requires me to do eight 1 min jogs. I find this too stenuous and not able to complete the whole 1 min from 4th jog onwards. Is there a way to dial down the intensity and follow a more gradual plan? I find that plans from Aptive in Audible is more suitable for beginners, provides encouragement and the background music is awesome as well. Slowing your speed down helps. If you find it hard this week... do what you can and redo the week more than once until you can. I've never been able to do one minute more than once or twice a run. This is my second week doing it, and at the beginning of this week I reset it so that I'm doing Week 1 again this week. I run us long as I can and then start walking. I am seeing Improvement so I would say definitely don't give up on yourself and don't worry if you have to walk during part or even most of the minute. I repeated week 1 as well. I wanted to be certain I was settled in with that before moving on. One thing all of my "runner" friends have said about when they first start was it takes time... they all said repeating weeks was not a problem at all. As long as you are working it will come. I would like some advice for a new runner. My calf muscles get pretty tight. Any suggestions for a good warm up/stretching routine? Hey guys, I need help, too. I did days 1 and 2 of week 3. My heartrate went up to 177 while running and it left me completely exhausted. My legs were aching and I was tired between the runs. What should I do? Go back to doing week 2 for a while? Or continue doing week 3? I would say go back. Your health is more important than a schedule. I did week one at least twice and week two maybe 3 times (I've kind of lost track now). 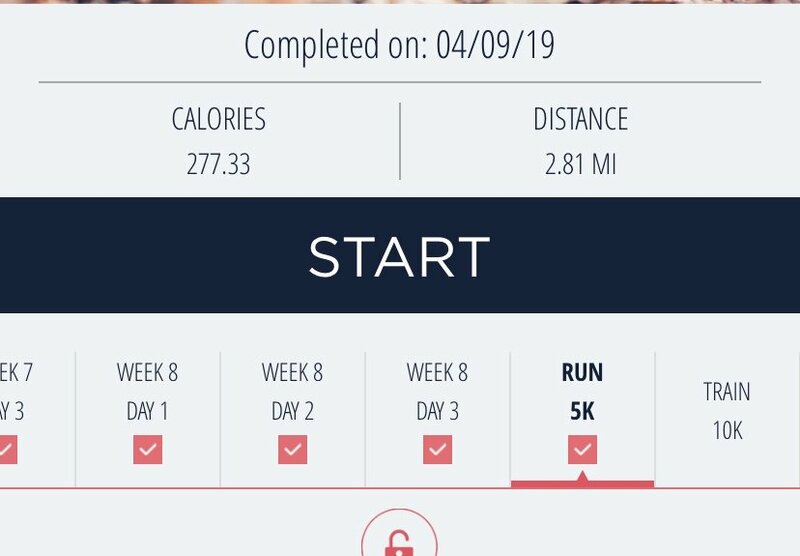 I did week 4 last week and will probably do it again this week, even though I can't really run for 3 to 5 minutes and I think I'm on a week 8 or 9 as far as how many weeks I've actually done the program. Thank you so much, Silver Pie! I will go back to week 2 then, for now. That sounds more doable at the moment. I didn't have to repeat week 1 or 2 but now I've come to week 3 I'm kind of stuck. Week 3 seems to be a big transition week for a bunch of us. You are making progress! Keep hanging in there! Thanks CleBkPkr, for your support. I was afraid I'd have to quit. But I don't wanna do that. You people in this forum are great! Sabeth no need to quit just keep doing the week you have trouble the best you can. I repeated week 1 and week 4. I never in my lif thought I could ever run 28 minutes without stopping but I just did it twice. In two days I am going for 30 and I am signrd up for my first 5k a week later. I reacted to your post with a trophy because I thought you deserve one. That is so awesome! You give hope to the rest of us. I'm still running a minute (or, if I'm lucky, a minute-and-a-half) at a time. My 5K is just under three weeks away, and I'm pretty sure I won't be running much of it. You still give me hope that, at some point, it may be possible to run 5 or 10 or even more minutes all at once. Thank you for that.